We have the boat, motor and trailer parts you need! 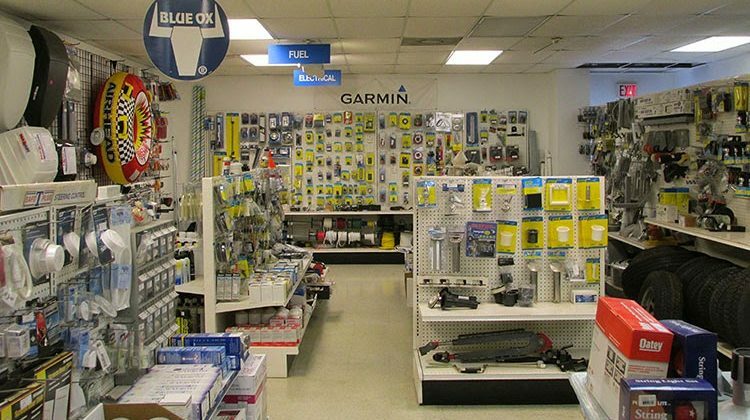 Boat and marine engine parts and accessories sales in Florida. Given the volume of boats, motors and trailers we sell, Top Notch Marine stocks boat and motor parts, and lots of them. And if we don’t have it, our buying power and certification as an authorized dealer means we can get what you need fast, and we will ship it out right away. We pride ourselves on our people. Professionals dedicated to finding you the right parts at the best possible price. We discount thousands of engine parts and accessories! We can get you every, Wellcraft, Monterey, Bimini Boats, Bayliner, Trophy, Cobalt, Key West, Largo, Godfrey, Hurricane, Nautic Star, Sea Fox, Evinrude, Bennington, Johnson, OMC, Yamaha, Volvo Penta, MerCruiser, Mercury, Suzuki, Tohatsu and Honda part and accessory available. Need help? Call Our Boat and Motor Parts Direct Hotline 772 237-3825. If you find a lower price on an identical item at a local or online retail competitor (including tax, shipping, handling and delivery fees), just bring us the competitor’s current ad or show a printout, photo, smartphone display or app, and we’ll match their price. Our price match policy doesn’t apply to certain products, brands; labor; closeout, discontinued, clearance, refurbished, used or damaged items. Limited to reasonable quantities. Can’t be combined with other discounts. Additional restrictions apply. See a sales associate or click here for details. Special order parts are not returnable. Please allow us to verify your internet part numbers. Parts and accessories export sales available. We ship boat and engine parts worldwide. The Bahamas, South America, North America and Europe just to name a few. We ship boat parts from Wellcraft, Monterey, Sea Fox, South Bay, Forest River, Cobalt and Bennington boat brand manufacturers. We also sell motor parts from Mercury, Mercruiser, Yamaha, Honda, Tohatsu, Nissan, Suzuki and more! Please use our international marine and boat parts email at parts@topnotchmarine.com or call our Parts Direct Hotline 772 237-3825. If your parts are damaged or shorted during shipping to you, please call Top Notch Marine within 24 hours of receiving your parts and report the issue to parts manager. Item is returned within 30 days of purchase and in pristine condition. Item was sold from Top Notch Marine stock. If a credit card was used for the purchase, refund will only be credited to original credit card used to purchase item. Please call us at 772 237-3825 to request a Return Goods Authorization (RGA) Number. Parts returned are subject to a restocking fee of 15% or more. NOTE: DO NOT return parts to Top Notch Marine without a Return Goods Authorization (RGA) number, as they will be refused. Insure the package for “full value”. Ship the package “freight prepaid”. No C.O.D.’s will be accepted. Outside the USA ship the package back “duty prepaid”. No duty shipments will be accepted. Warranties are established by, and the responsibility of, the manufacturer, and the final determination of warranty adjustments rest with the manufacturer. Most manufacturers now require the end user of their products to contact them directly for warranty issues. In order to expedite your claim, please contact the manufacturer first to receive instructions, and always get the name of the person with whom you speak.